Jump aboard the green smoothies train! Here are enough green smoothie recipes to keep you busy for months exploring all of the different flavor combinations. Enjoy the healthy benefits! Spinach is the cornerstone to many green smoothies, and it forms the foundation for this superfood smoothie. What a great way to start your day, or to give yourself a burst of clean energy any time you need it. It’s one of our favorites and sure to be one of yours too. The Green Thing might sound like something from a B movie horror flick, but you don’t have to be scared of it, it’s here to help you. The blend of a dozen different ingredients means you’ll be stocking up on essential vitamins and minerals that your body requires each day. Smoothies are a great post-workout routine if you add in some protein so your muscles have something to feed on. Here they’re using peanut butter, Greek yogurt, and chia seeds for the protein, and they’ve got the taste just right so you’ll look forward to these every workout. With a name like The Hulk you know you’re getting a powerful smoothie that will power you through your day and make you feel like you can do anything. Stephanie says it will help you think better, get more done, and can also improve your skin. With the spinach, hemp seed, and chlorella she’s probably right. Tango with this green smoothie and you won’t regret it. Lisa is relying on the awesome flavor of fresh mango to help this live up to its title, and supporting the mango with banana for added sweetness and nutrients. Spinach and kale give it the required coloration. This smoothie has been dubbed a Greeña Colada since it is modeled after the famous piña colada and shares many of the same flavor notes. You’ll revel in the flavor and be glad to know that it’s helping your body with pineapple, banana, and kale for loads of nutrition. Getting the right probiotics can be a big help to your digestion, especially if you’ve been experiencing unidentifiable digestive issues. To help your tummy Danielle is using coconut water kefir which provides the digestive system with important enzymes and minerals that help it break down food better. Smoothies are a great detox aid when they’re done right, and there are plenty of detox green smoothie recipes to try. This one by Gina is loaded with vitamin-filled vegetables, fruits, and powdered greens that can help your body rid itself of toxins and have you feeling amazing. Have you tried a hot smoothie yet? If not this is a great recipe to start off with. To make it hot they’re using green tea, which also adds more antioxidants to this already healthy smoothie. It’s a great recipe to help fight off the winter blahs, and keep your immune system up. Want to have a super good morning? Start it off with this offering from Erica and you’ll have the best chance possible. Blueberries and bananas will please your taste buds, and she keeps it dairy free with the use of almond milk and piles on the nutrients with flax seed and spinach. Take a trip to green smoothie nirvana when you blend up this creation by Delectably Green. The addition of avocado is something you’ll see in a handful of the smoothies on this page, and with it comes healthy fat, fiber, and more potassium than a banana. Here’s a way to get the nostalgic feeling of an orange creamsicle, while doing something right for your health. This green smoothie has fresh mandarin oranges in it for that classic flavor, and coconut milk, protein powder, and yogurt to give it all the creaminess it needs. You probably wouldn’t want to sit down to a plate of spinach and a banana, but somehow it works when it’s all blended up into the smoothie. Adding in the pineapple gives it a sweet and tart flavor that makes it so the spinach takes a back seat in terms of taste. The cool minty flavor in this green smoothie goes well with the taste of chocolate, and you’ll forget that you’re drinking something that’s good for you. With a smoothness provided by avocado and yogurt, there isn’t anything not to like about this tasty beverage. Spirulina is a very helpful supplement but can be a bit rough to drink down on its own. Mixing it into a great tasting smoothie is one way to make sure you get its benefits while drinking something you enjoy. The powerful flavors of pineapple and mango totally override the spirulina. Kale provides you with both Vitamin A and Vitamin C as well as important minerals like magnesium and potassium. Avocado provides you with fiber, healthy fat, and added potassium, and when you pair these two together you’re getting quite the nutrition boost. There’s an apple thrown in to insure a good flavor. There’s much to enjoy about this strawberry pomegranate smoothie. Even without adding in the spinach it’s a healthy drink thanks to the antioxidants in the strawberries and pomegranates. They’ve layered this smoothie so you can see the color difference between the ingredients, but you can always mix them up. Melons are a wise smoothie choice because of their sweetness and smooth texture. Here Laetitia is using honeydew melon which will provide a soft and subtle flavor, and supply you with a boost of Vitamin C. The spinach rounds things out nicely and adds more vitamins, minerals, and fiber. Although perfect for the holiday season, this smoothie can be enjoyed year round whenever you have the need for a burst of energy. Ginger, spinach, and medjool dates form the backbone to this smoothie and provide you with plenty of what you need to have that get up and go feeling. Green apples go well in a green smoothie, even though only their skin is green. They provide a sweet and sour flavor that helps to mask the veggies behind it, perfect for those that aren’t fans of the flavor of spinach and other leafy greens. She’s even managed to fit zucchini into this. Want to keep your smoothie simple? There’s no better way than to limit the number of ingredients you use in it. With a short list of ingredients you have a stronger understanding of what’s in your smoothie, and you can play quality control inspector that much better. This smoothie gets its apple flavor from apple cider, so it has a robust taste since they’re using real cider and not the kind that’s been sugared up. With lots of kale, a banana, and a dash of cinnamon, this is just the thing for when you’re trying to detox from holiday eating. Find a new appreciation for winter when you make this smoothie out of fruits that are their ripest during the winter season. 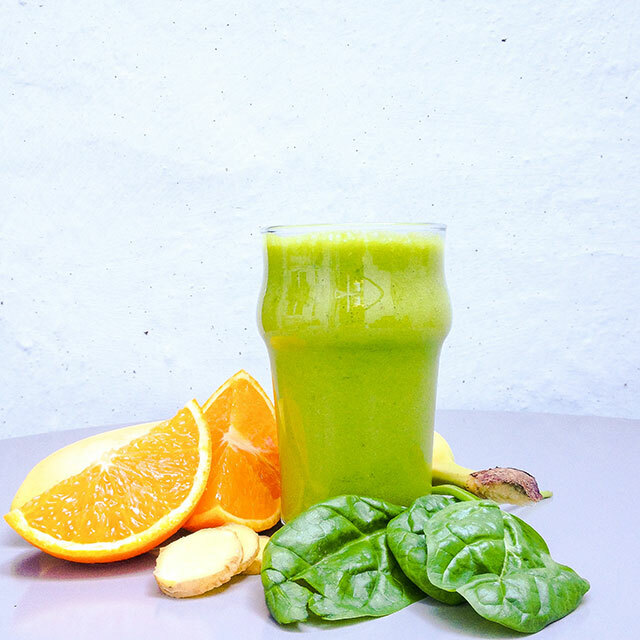 Clementines and grapes give this a nice sweet and citrus combination, and spinach works its magic as a green smoothie rock star to bring load of nutrients. Keeping it simple is the name of the game, and when you need some protein in your life, look no further than this green smoothie. Peanut butter and protein powder make sure that you’re getting a good dose of it, and there’s spinach and bananas to add in more vitamins and minerals. Give into deliciousness with this pear avocado smoothie. The sweet flavor of the pear coupled with the smooth texture of the avocado makes it simply irresistable. Spinach gives it its green hue, and a spot of honey gives it a sweetness from a natural source to keep it healthy. Here’s what Amanda considers her favorite green smoothie recipe, which includes a mix of orange juice, bananas, dates, and avocado. Of course there’s also some spinach in it, making this a can’t-miss addition to your collection of green smoothie recipes. Blend, drink, repeat! In this smoothie recipe they’re using coconut water instead of regular water or ice, so you’ll be getting added enzymes and minerals that you wouldn’t otherwise get. Bananas, apple, and mango are the fruits they’ve chosen, and they’ve opted for kale as their leafy green of choice. Going tropical is a popular way to jazz up a green smoothie, and this is Becky’s take on how to get it done. She’s going with pineapple and mango as her island fruits, adding in a banana because bananas just taste great in smoothies, and finishing it off with spinach. Kick that cold to the curb with this Get Well smoothie. This is specifically designed to give your immune system a boost so that it can take care of whatever it is you’re ailing from. The spinach alone could give you the required Vitamin C for the day, but they’ve added oranges to be sure. You can have chocolate and still have a healthy smoothie, and this recipe provides the proof. Raw cacao powder is where this is getting its chocolate flavor, and cuts out the dairy and sugar found in commercially produced milk chocolate. The supporting ingredients are all good for you too. Can’t choose between apples and pears in your green smoothie? Now you don’t have to, because they’re both in this recipe. They’re joined by a healthy serving of spinach, as well as oats and pecans to give it a nutty flavor. Be sure you have a powerful enough blender for this one. If you’ve been wanting to add green tea to your daily routine but have struggled to turn tea drinking into a habit, try making your green smoothies with green tea in them. You’ll benefit from the antioxidants in green tea without having to sip from a steaming mug of it. This smoothie attempts to capture the essence of pumpkin pie and serve it up green smoothie style. They show you two ways to make it, with the second option being the green option and requiring only that you add in some spinach. Don’t worry, the spinach won’t take away from the flavor. Kale forms the base for Oriana’s green protein smoothie, which means you’ll be getting fiber, vitamins, and minerals built right in. There’s also hemp protein powder added, which insures you won’t be short on protein and blends in well with the bananas, mangos, and Greek yogurt. This smoothie is an absolute powerhouse, and you’ll notice it both in the way it tastes and the way it makes you feel after you drink it. Unlike an “energy drink” this smoothie will give you true energy from natural sources and it will keep you sustained for hours with no crash later. Spanish for “greener” this smoothie is just that. It’s made up entirely of foods that have a green shade to them, such as kiwis, avocado, kale, and parsley, so it’s going to come out greener than green. For sweetness she’s using agave nectar, which helps keep this a low-carb treat. Here’s Chelsey’s take on a green smoothie, and we think she’s done an excellent job. She’s using sunflower seed butter which will add in healthy fat and give it a nutty flavor without using nuts. She’s also using soy milk so this is a good smoothie option if you’re trying to stay dairy free. 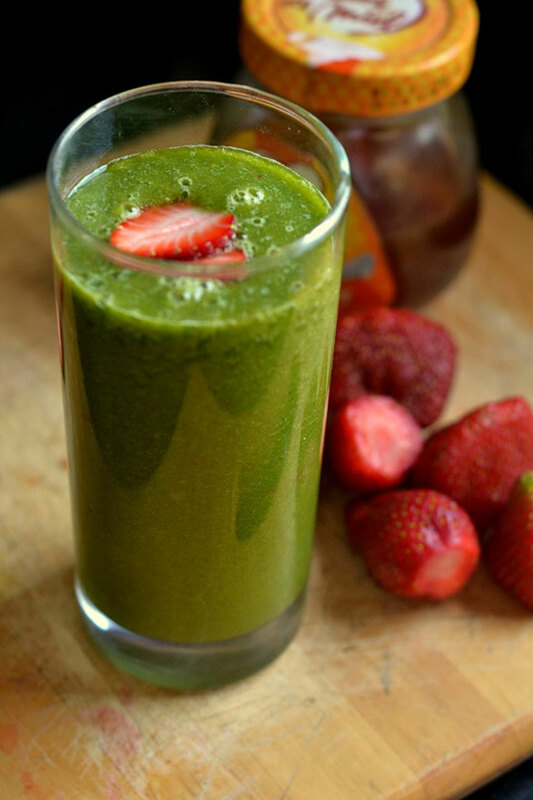 You don’t often see strawberries and cucumbers being combined, but in a green smoothie it works. There’s also Swiss chard and romaine lettuce added, so the cucumber is not the only green ingredient. When it’s all blended up you’ll be amazed that this works so well. When making a green smoothie in the morning you want to be sure that you use items that will help perk up your taste buds, and that have the sort of nutrients that will help you shake the morning blahs. This recipe does just that with apples, strawberries, and a kick from ginger. This smoothie is for those that are a little skeptical that a green smoothie can both satisfy your hunger, curb cravings, and also be good for you. The combination of peanut butter and banana is a well-documented winner, and adding in cucumbers, kale, and flax seed makes it nutritionally sound. While many green smoothies call for spinach, this one is breaking form and using arugula. If you’re not used to using arugula in your cooking or in salads, it has a more peppery flavor than spinach, but is still a nutrient storehouse and provides you with vitamins, minerals, and fiber. Keeping your green smoothie low in sugar is important because it will keep its calorie and carb count down as well. 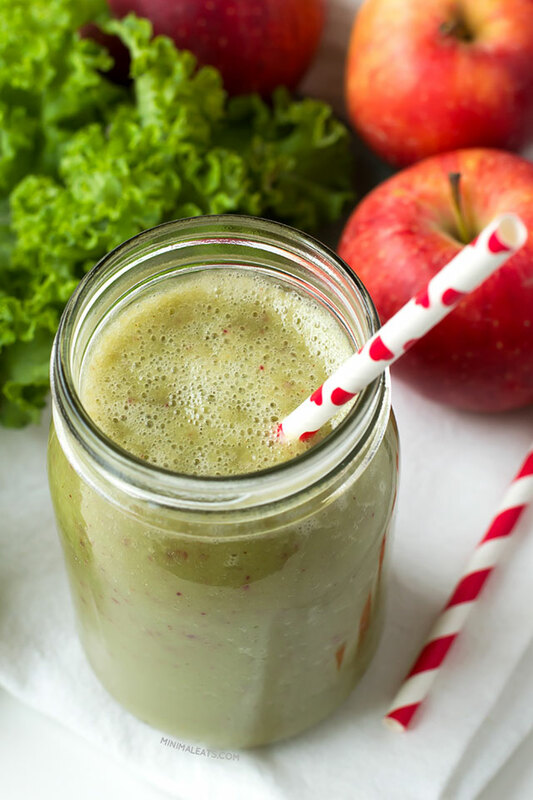 Jill’s done a great job of using mostly vegetables in this smoothie, with green apple providing both sweet and tart flavors so that it tastes great. This smoothie is so green it’d be the the one Miss Piggy would be most attracted to. The color comes from plenty of cucumbers and some spinach, with added nutrients from ginger and a granny smith apple. Honey provide can’t-miss sweetness you’re sure to enjoy. Don’t be alarmed, this is a friendly monster that only wants to add vitamins and minerals to your day. Originally created as a post-Thanksgiving detox smoothie, you can enjoy this any day of the year when you’re feeling like you need to give your digestive system a break. Since most green smoothie recipes use fruit as a way of overpowering the flavor of the vegetables, this is an interesting no-fruit version. Spinach, avocado (technically a fruit), and protein powder give this smoothie all the nutrition and flavor you could ask for in a glass. Adding some matcha powder to your smoothie is a great idea. You’ll be getting the antioxidants from green tea that continually make health news headlines without having to brew a pot of tea. Adding in mango is pure genius, as the two flavors complement each other rather well. What’s great about this recipe is that she gives you a visual representation of why green smoothies are so nutritious. You’ll see that the bulk of the drink is actually greens, in this case baby spinach. There’s roughly 30% that’s fruit and the rest is coconut water. When you’ve just finished a hard workout and you’re looking for a recovery drink, go the all natural route with a green smoothie. Adding in protein powder means you’ll get the same amount of protein from a store bought drink, but with added fruits and vegetables freshly blended. Combining pineapple and peaches is a great way to start off a delectable green smoothie. From there it’s just a matter of mixing in some spinach, and some Greek yogurt for creamy smoothness. The stevia extract helps cancel out some of the sourness of the pineapple. This smoothie has a lot going on, but since all of it is healthy and tasty you won’t mind at all. 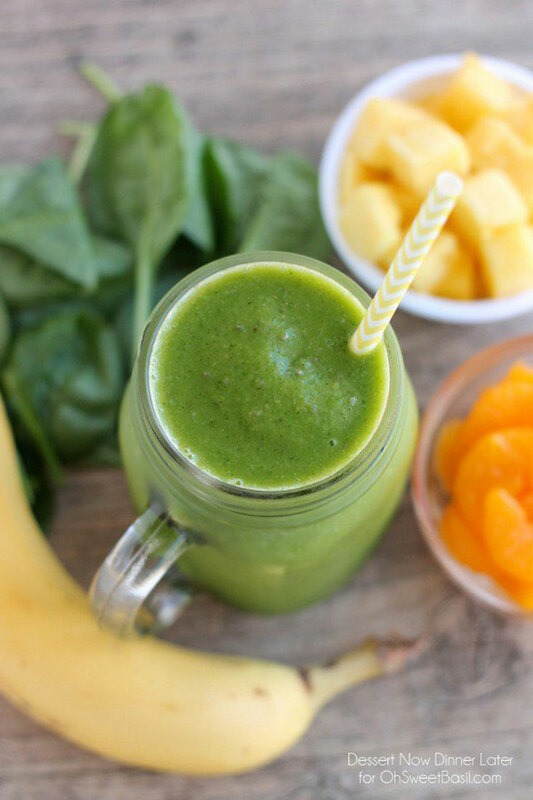 There’s pineapple, oranges, and bananas for the fruit, and spinach gives it the greenery. For good measure she’s added in chia seeds for added fiber and protein. Here’s a smoothie recipe that packs on the protein so you’ll end up feeling satisfied long after the glass is emptied. Almond butter and vanilla protein powder will insure that your protein needs are met, while spinach, mango and banana help with their wide range of nutrients. They’re not skimping on the peanut butter in this green smoothie, which means there’ll be healthy fat, protein, fiber, and some minerals built in. Chocolate almond milk is what gives it its chocolate flavor, and a generous serving of spinach gives it its green color and more nutrients. Because of its rich green color and naturally sweet flavor you’d think you’d see more kiwi being used in green smoothies. 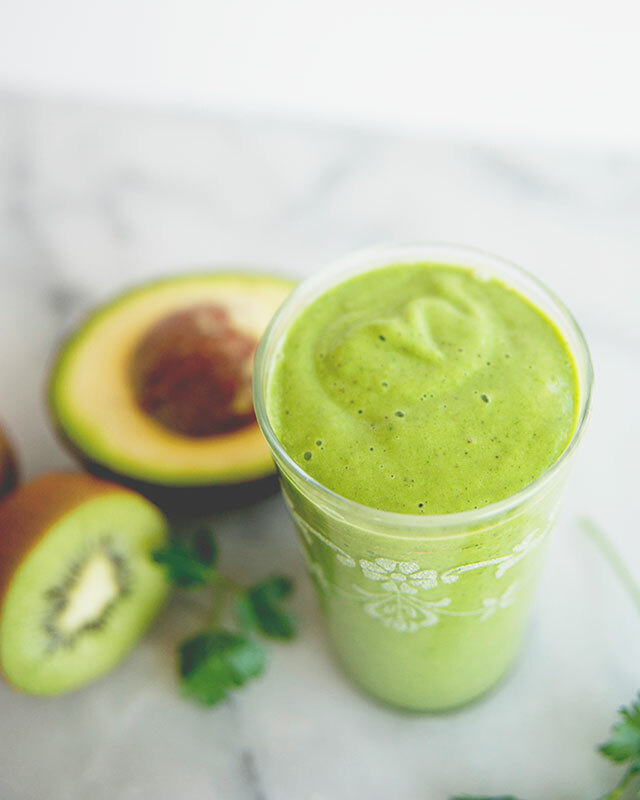 This smoothie recipe uses an entire peeled kiwi so you’re sure to taste its flavor rising above the rest. Both spinach and kale are used for a double dose of nutrition. 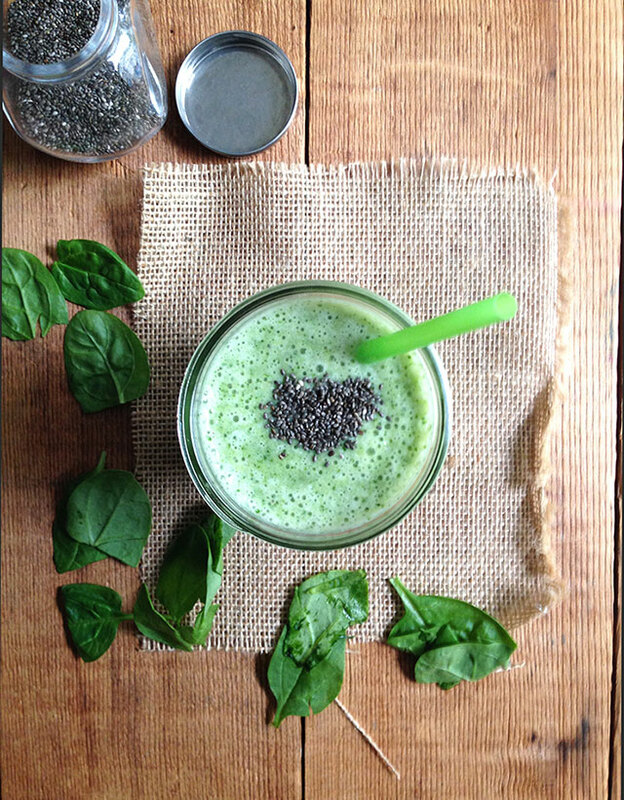 Danielle is taking it back to basics with this green detox smoothie. Bananas and pineapple are the fruits being used, with spinach the vegetable of choice. Detoxing is all about simplifying, cutting out the junk, the processed foods, the unnecessary, and getting back to all natural foods. Kale has enjoyed a lot of time in the limelight, and for good reason. It’s rich in plenty of vitamins and minerals, is full of fiber, and even boasts some protein. They’re taking full advantage of these facts in this kale smoothie recipe, which also contains bananas, apples, and coconut milk. This green smoothie breaks away from convention with a few ingredients that are bound to catch you off guard. There’s green tea, full of catechins that have been scientifically proven to help prevent and battle back cancer. There’s also ginger, which has a cleansing effect on the body. Apples are a great fruit to pair with kale because kale has such a robust flavor to it that it needs a fruit that can rise above it. This is made with quinoa milk, and they even show you how to make your own in a separate recipe. Definitely worth checking out for something new to try. Sweetness is one way to lure you back to a green smoothie time and time again, but you have to be careful not to make it so sweet that it no longer has a positive effect on the body. Here Kathy has really pulled it off with apples, bananas, and plenty of green leafy goodness. 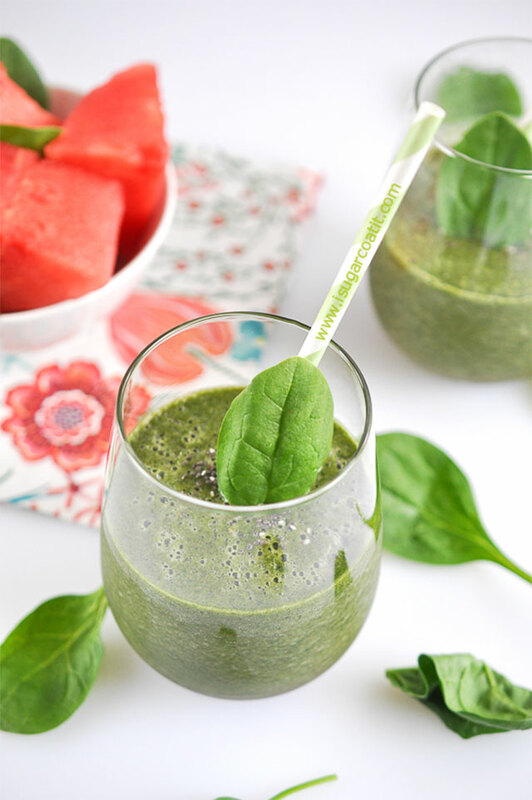 Take advantage of all summer has to offer with this summer green smoothie. It capitalizes on fruits and vegetables that are their freshest during the summer months, and sure to help keep you cool when temperatures rise. Peaches and pineapples stand out amongst the spinach. Using foods to help you look your best is the fun and delicious way to increase your beauty from the inside out. This smoothie features foods that all have healing effects, and will help undo some of the damage caused by living in our modern world and eating processed foods. The big force behind this smoothie is that you add in your choice of superfood, and they’re suggesting either wheatgrass, spirulina, or maca. Either one of these will give this smoothie a nutritional advantage over any other snack or light meal you could go with. Just about every smoothie in our collection of green smoothies will boost your metabolism, but this recipe is geared specifically for that purpose. They’re getting it done with a mixture of green tea and grapefruit, both proven metabolism boosters. Add in spinach and whey protein and you’re set. 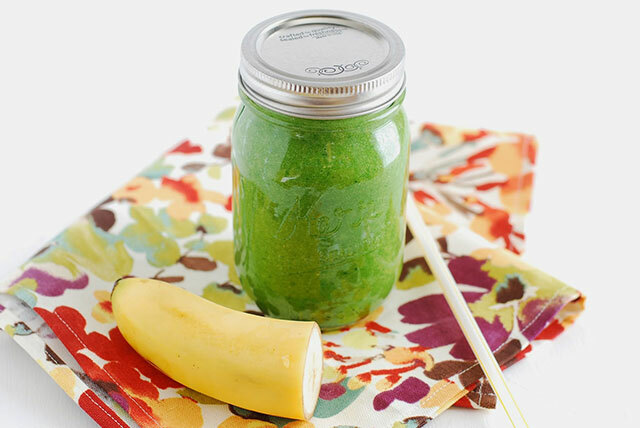 Take a walk on the tropical side with this tropical green smoothie. 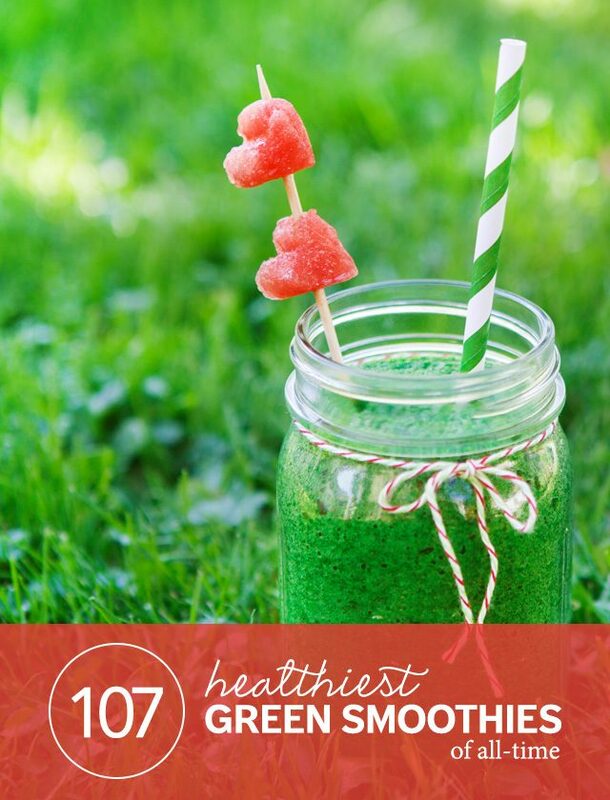 It has fresh watermelon in it, which few other green smoothies contain. It also has pineapple and mango so you’re definitely getting some island flavor. Fresh baby spinach tops off the nutrition for this drink. This green smoothie is sure to help with your hydration, and is a great choice for after a sauna or jacuzzi session when you need to replace some electrolytes. It uses coconut water which contains enzymes and minerals that replenish you far better than a sports drink. What to do when you just want to blend up a smoothie for one? Try this single serve Green Reset smoothie. It’s a way to hit the virtual reset button on your day, and can come in handy when you’re feeling overwhelmed and need to up your energy reserves. 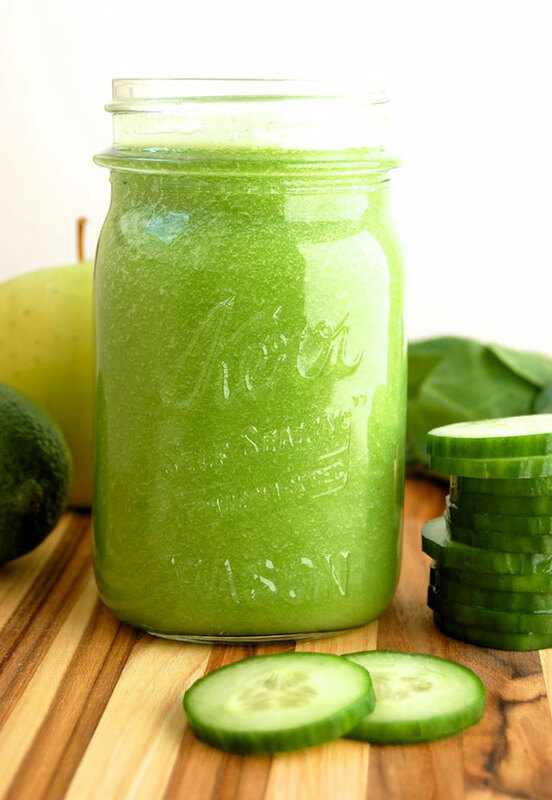 Unleash the flavor of an actual apple pie when you drink down this green apple pie smoothie. With its combination of oats and honey, in addition to fresh Granny Smith apples, you’re getting a similar taste without having to feel guilty about eating too many servings of pie. Many smoothie recipes contain a banana to give it that specific smoothie texture. But if you’re not a fan of bananas Lauren has you covered in in green detox smoothie. She’s included a wide assortment of vegetables, and kept the entire thing vegan and free of gluten. Aside from adding healthy fat and an amazing nutty flavor, cashews also act to help make this smoothie incredibly smooth. Vegans have been using cashews for years as a way to make soups creamy, but in this case it’s smoothing out this nutritious green smoothie. 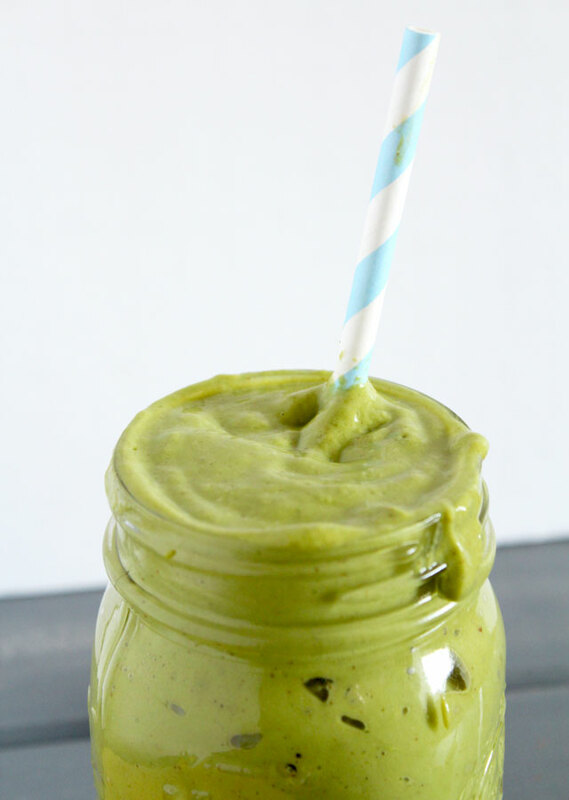 In this protein green smoothie they’re using brown rice protein powder to supply the protein. This would be a good option for those looking to avoid whey protein due to the lactose. Chlorella and kale insure that you’re adding to your nutrition for the day, and kiwis and banana make it taste good. Paige’s version of a green smoothie is one you’ll want to try if you happen to have the necessary ingredients already in your kitchen. And since she’s using some pretty common ingredients there’s a high chance you can make this and be drinking it in the next couple of minutes. When you add together three superfoods you know your body will thank you. The trick is putting them in a smoothie so that it’s easy to drink so you enjoy it and drink it more often so that you can get those nutrients into your body on a regular basis. This green smoothie is going to be one you’ll want to commit to memory, that way when you’re at the store you can get the items needed to make it so you alway have them on hand. Avocado and banana are enough to make this super smooth, and you can use either baby spinach or baby kale. Here’s a smoothie that actually adds in some chili peppers so it has a flavor that is unlike anything else you’ll try. Add to those the ginger and curry leaves and you’re looking at a ton of different flavors that blend together well. The yogurt gives it that smoothie creaminess so it’s easy to drink. This is an interesting smoothie recipe that we simply had to include because of the ingredients it uses. The honeydew melon adds its flavor and combines nicely with the green tea. The tapioca pearls have a unique texture and this is the only green smoothie recipe we’ve found that uses them. You’re going to love how easy this smoothie is to make and to drink. By adding in frozen berries you’re adding in antioxidants and plenty of palatable flavor. The ground flax and chlorella mean there’s a ton of nutrients in just one glass. The perfect pick-me-up when you’re worn down. If you have five minutes you can whip up this spinach smoothie and be on your way with the rest of your day. There’s no need to make a green smoothie complicated, and if it’s quick and easy you’re more likely to make one and drink it. Starting this recipe off with unsweetened coconut milk is a good way to go. It keeps it dairy free, adds in a hint of coconut flavor, and make it as creamy as you can stand. Of course it also contains fruits and vegetables for their nutrients, and chia seeds, ginger, and dates for even more nutrition. 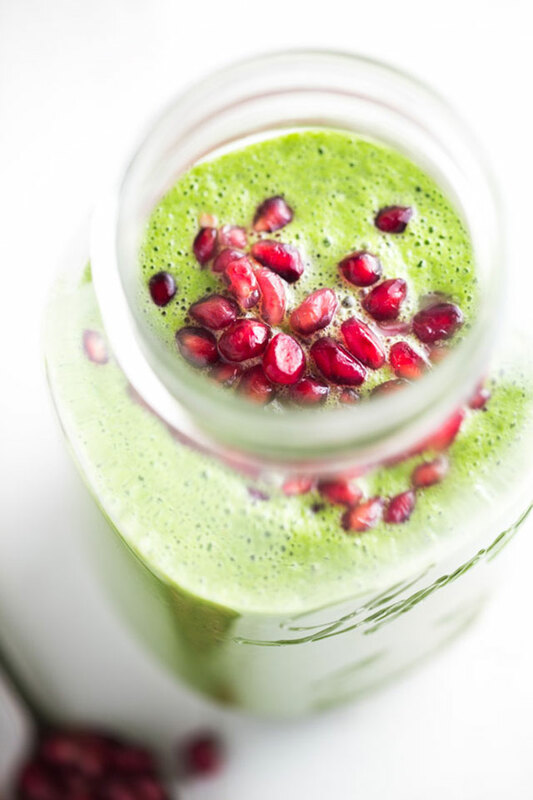 This smoothie is going green in a big way, and it ends up with a vibrant color that will appeal to the eyes, and a flavor profile that will appeal to your other senses. Grapes, pineapple, and banana provide all the sweetness, and spinach adds in its array of vitamins and minerals. They say they’re gettin’ figgy wit it with this green smoothie recipe and that’s because they’ve added in some green figs along with their nutrients and distinct flavor. A banana and your choice of greens is what rounds this recipe out, but they do offer plenty of suggested add-ons. Keeping a smoothie low-carb is not always easy, but Andres has done a good job of it here. He’s gone with loads of spinach, a naturally low-carb vegetable, and added in some avocado to make it smooth and provide a host of healthy benefits. Vanilla protein powder finishes it off. Avocado, mango, and banana get blended together for the most smooth of smoothies in this tropical creation. She’s going with almond milk on this which makes it dairy free, but she also mentions that you can use your favorite form of milk. Shredded coconut is a nice finishing touch. If you love peanuts then you’re going to want to try this green smoothie. It not only uses peanut butter, but also adds in whole peanuts that you blend up for even more peanutty flavor. Bananas and spinach are the two other ingredients you’ll taste, but only behind the peanuts. Power up with this green smoothie and you won’t regret it. It uses one of the most nutrient dense fruits out there: goji berries. You add them on whole to the top of the smoothie, and they’ll give you something to chew on while you drink your tasty beverage. In this recipe Alexa shows you how to make a green smoothie that will help boost your immune system so you can heal yourself. Spinach, coconut oil, cherries and berries all combine to form one unique smoothie that contains vitamins and antioxidants that will make you feel good again soon. If you’re going to say you’ve got the perfect green smoothie, you’d better back it up with the goods. That’s what Dianna’s done here and she’s really hit the mark with her creation. She’s using coconut water for added nutrients, and tahini for a very distinct flavor. 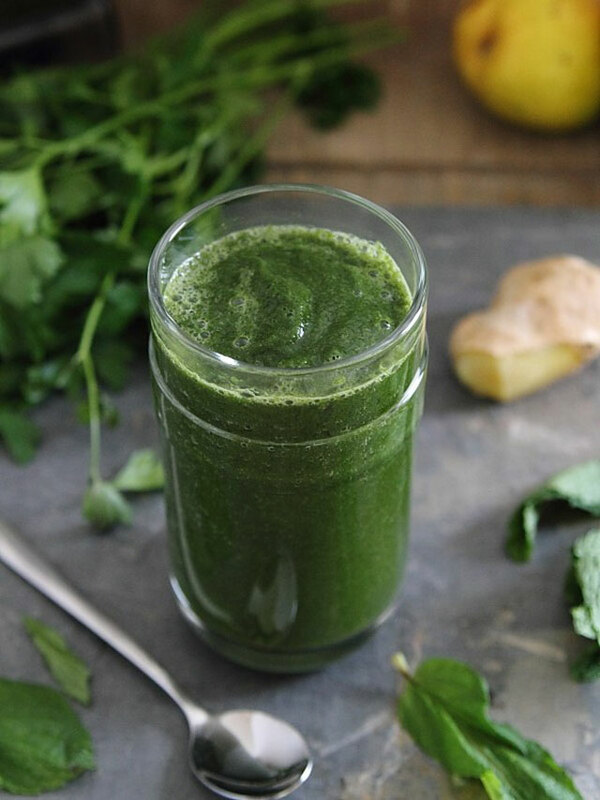 Here’s a detox green smoothie that’s packed with fiber so your digestive system will thank you. Your digestive system gets the spotlight when it comes to detoxing because it’s the main way to get toxins out of your body. That’s why a smoothie like Kaylee’s is so helpful on a detox program. The time-tested flavor of apples and cinnamon mean that you don’t have to wonder if this is going to taste good or not. Kiwis and spinach give it its green color, and provide you with vitamins and minerals while flaxseed provides the plant based form of omega-3. 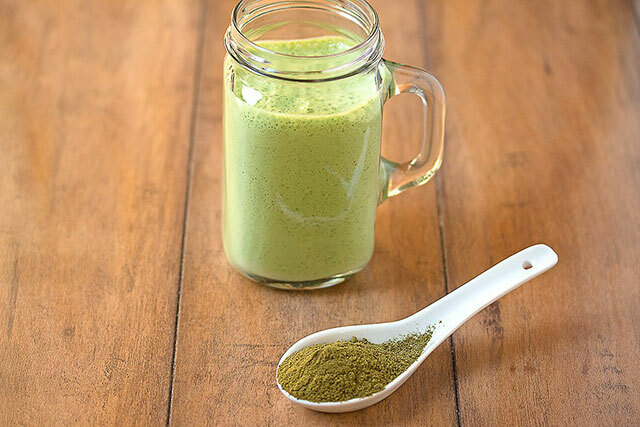 Here’s a green smoothie that harnesses the healthy powers of matcha powder. Matcha powder is what is used in traditional Japanese tea ceremonies and has a taste that is different from the bagged green tea sold in stores. You simply must try it in a smoothie for a nutrient-packed treat. When you have three fruits that taste so good all by themselves and throw them into a blender together you know things will turn out fine. A heaping portion of spinach sneaks in the side door but your taste buds will never know it thanks to the three powerfully flavored fruits. Mint is a great flavor to combine with the tartness of citrus, and this smoothie is one that you’ll enjoy drinking more than once. Oranges and lemon provide the citrus flavor, with an additional layer of flavor from ginger. Fresh mint insures that you will definitely taste the mintiness. This is a recipe that tries to bring you the flavors of Brazil in smoothie form. Fresh mango joins together with pineapple and a banana for quite the taste sensation. But one of the best addition to this smoothie is the acai powder which gives it tons more flavor and nutrients. You’ll love the papaya flavor in this smoothie, especially when it combines with the strawberries. The spinach takes a backseat in terms of taste, but lends its green pigments so this lives up to the green smoothie label. A little bit of honey lets the fruit stand out and makes it even tastier. 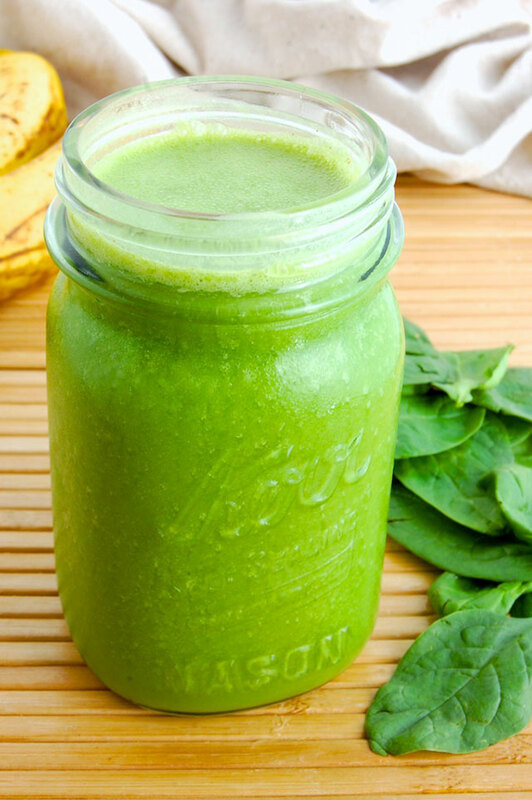 Knock that cold out once and for all with this Cold Buster green smoothie. It has what your immune system is craving as it battles back, including Vitamin C from grapefruit, pineapple, and kale, and important minerals from chia seeds. You can also drink this before you get sick. After a nice jog this is a great smoothie to blend up and relax with. It’s a raw, gluten-free and dairy-free way to go and will help you replace any vitamins or minerals you’re running low on, without making you feel heavy or bloated after your workout. This tropical smoothie mix of pineapple and mango is something special because of all of the special add-ins it contains. You’ll get added protein and fiber from chia seeds, as well as a lot of Vitamin C from oranges, lemons, and spinach making it a big boost for your immune system. Tink would be proud of this green smoothie, and it’s one you’ll definitely want to try. It contains plenty of vitamins from apples, oranges, and pineapples, but what really puts it over the top in terms of taste is the use of vanilla frozen yogurt. It’s like pixie dust in a glass. 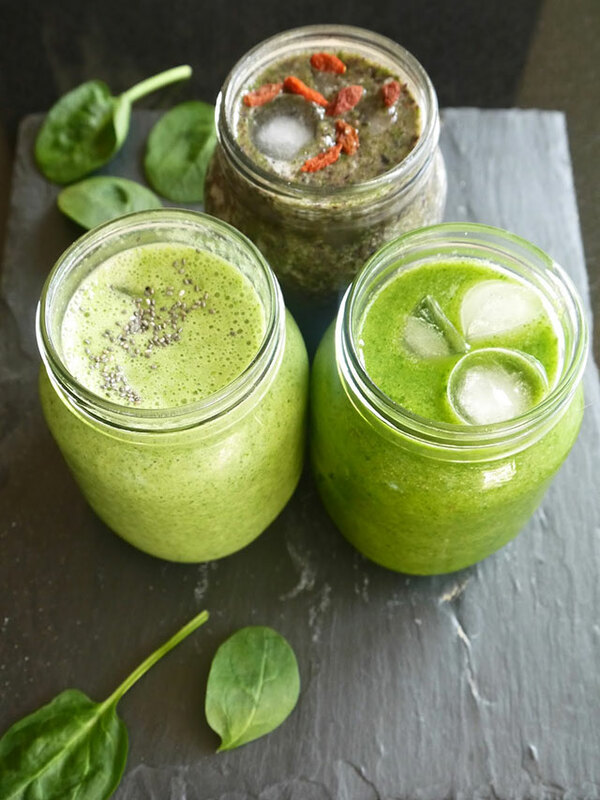 Some green smoothies really attack your taste buds, so here she’s gone with some lighter ingredients, ones that are more subtle in nature making it easier to drink. Highlights are the arugula instead of spinach, and pears, bananas, and celery to keep it light and breezy. This detox smoothie is best consumed in the spring, and the springtime is a great time to detox the body after a long winter. With three types of greens this is just the sort of thing your body needs to shake off the rust and get back into gear if you’ve been hibernating all winter long. Annie takes you on a tour of green smoothies and shows you a variety of ways that you can mix up the ingredients for a different experience. Our favorite is the third one down, which contains acai, maca, and baobab powder so you’re inundating the body with a ton of nutrients. Here’s a smoothie that’s so good they’ve dubbed it a Super-Smoothie. If it had a chest there’d be a big S on it. It’s packed with good things for you like probiotics, as well as hemp hearts and chia seeds for good measure. There’s also organic spinach to avoid pesticides and herbicides. Pretty much everything that goes into this smoothie is green, which is likely how it got its name. There’s pineapple in here as well, which won’t spoil the green color scheme, and adds in plenty of flavor. Cucumbers, kale, avocado and more make this one a sure winner. Make up a tempting smoothie for just yourself with this single serving recipe that’s like eating an apple pie. Many smoothie recipes make 2 or more smoothies so it’s nice to get the instructions for a smoothie that you can make when it’s just you that wants one. With a select group of ingredients geared at helping the body release stored toxins, this is one smoothie you won’t want to miss. Ginger, chia powder, spinach, and mango are all great detox foods, just be sure that you’re eliminating any foods that could be toxic while you’re detoxing. Bananas and mango are all you really need to make a tropical tasting smoothie. What makes this version special is the use of turmeric powder. This is a superspice that contains antioxidants that can help the body battle free radical damage, and also has a great flavor. Although this smoothie was created for St. Patrick’s Day you can enjoy it any time of the year for a protein boost. The protein comes from vanilla whey powder as well as a bit from the avocado. Fresh mint and baby spinach give it all the green it needs for the name leprechaun. Cinnamon is the spice of choice when it comes to making apples taste better, and here they’ve done a good job of delivering delicious apple flavor in a green smoothie. Organic spinach is always a great idea because its leaves are so absorbent and it soaks up chemicals as it grows. Let’s end our list with a smoothie that you can blend up to start your day. Almond butter gives it a great flavor that your taste buds will appreciate in the morning, and also helps to thicken it up. Both kale and spinach are used so you’re starting off with two servings of vegetables. Blending through life for the last 3 years. I believe smoothies are the perfect way to detox, stay fit and fuel your body. Please let me know if you have any questions! Thanks Rebecca for linking to my smoothie! This list is so awesome, I’ve been wanting to try out different green smoothies and this is just perfect! 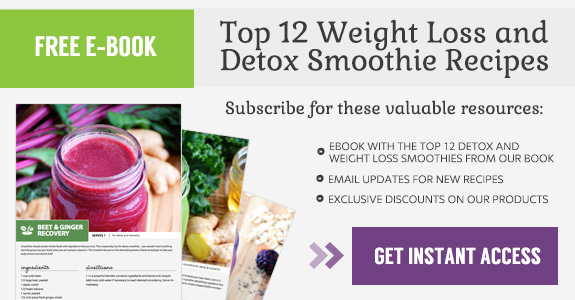 Thank-you so much for such a great list of smoothies .. I’ve bookmarked a number of them to try! VERYINFORMATIVE. THANK YOU FOR EVERYTHING. MAY GOD BLESS YOU…. Thanks so much for including my mint chocolate chip green smoothie! Pinned! Hi there, thanks for linking to My Food and Happiness. This really is an amazing green smoothies collection! First I have to try them, I’ll let you know.